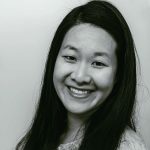 Published Oct 22, 2017 By Julia 3 CommentsThis post may contain affiliate links. 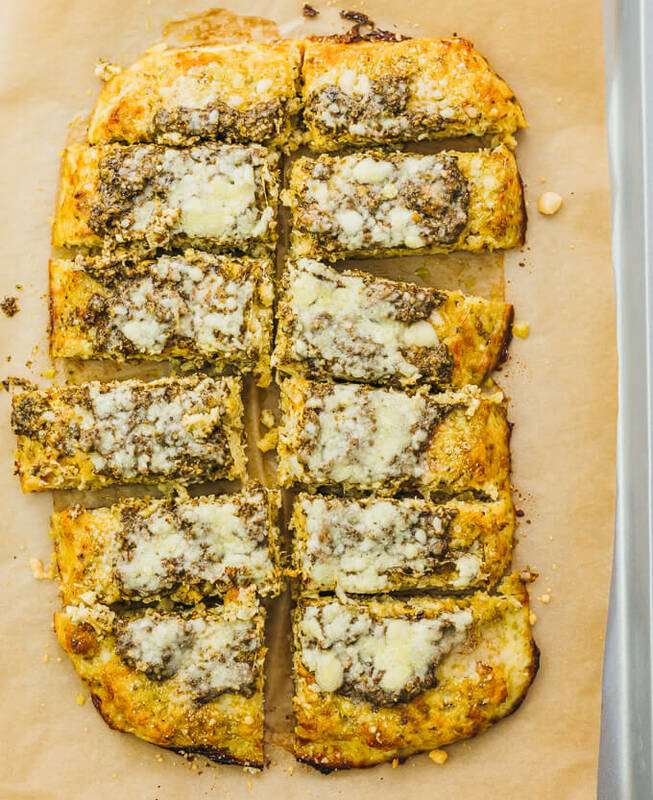 Make this healthy, low carb flatbread recipe using riced cauliflower. It’s topped with pesto sauce and grated parmesan cheese. 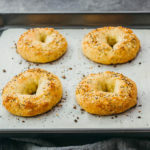 If you’re craving bread-type things like pizza, flatbread, bread sticks, and focaccia, but want to eat them guilt-free, then you must try this low-carb, gluten-free cauliflower flatbread. 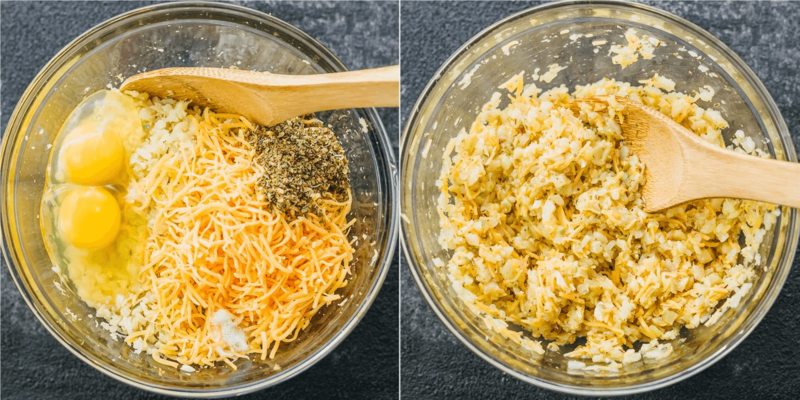 It’s easy to make using simple ingredients such as cauliflower, eggs, cheese, dried oregano, and salt, and the topping is simply pesto sauce and parmesan cheese. This flatbread is great as an appetizer for the upcoming holiday season, or you can eat larger sized portions as your dinner (less than 5 grams of net carbs for a 500-calorie serving). The flatbread is sturdy, holding its shape well, and has crispy sides. There isn’t much of a cauliflower taste to the flatbread, and the oregano spices give it a nice savory flavor. 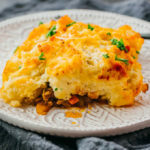 I’ve experimented with this recipe a couple of different ways — varying the amount of cauliflower, modifying the cauliflower consistency, and using different toppings. 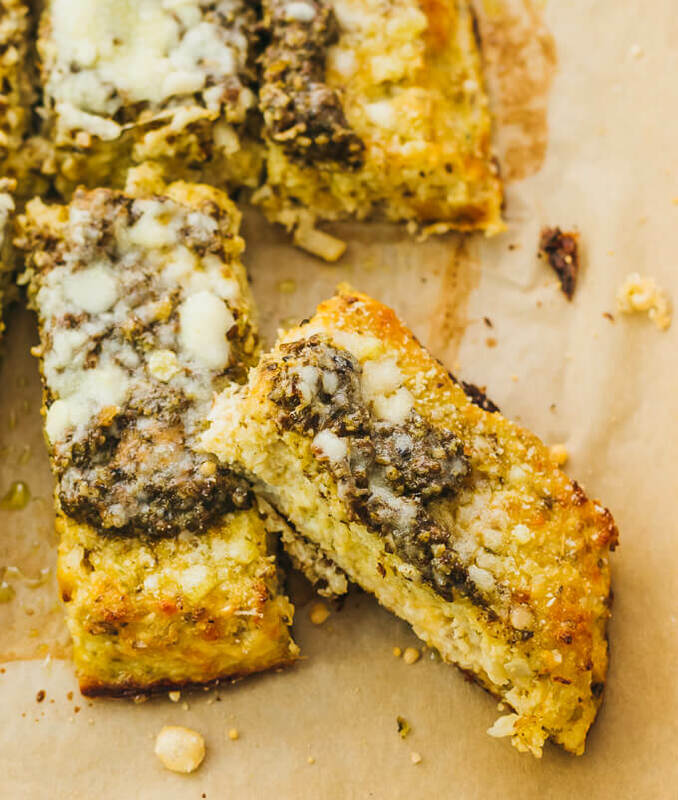 This pesto and parmesan cheese topping is my favorite due to the combination of flavors. I would probably also enjoy topping with asiago cheese, and you might like softer cheese such as mozzarella. 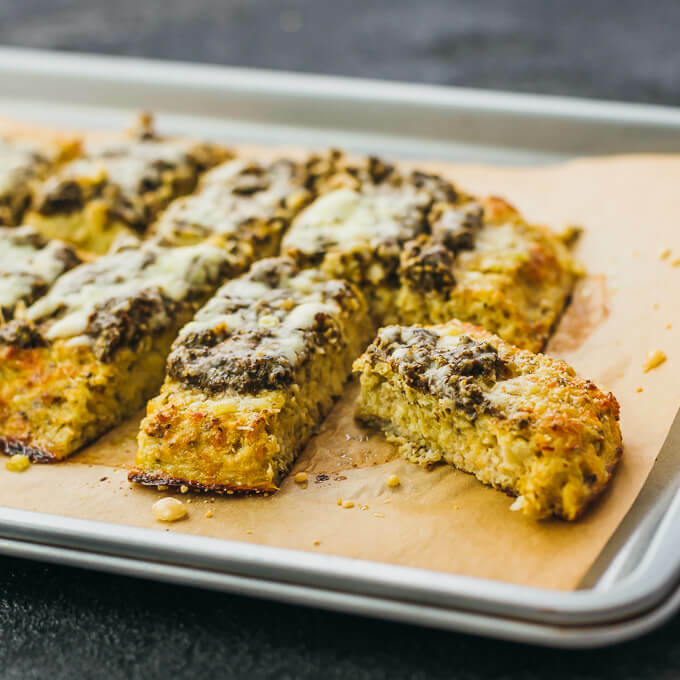 I’ve made this recipe with both drier riced cauliflower as well as wetter cauliflower and both will work well — the flatbread will hold together and be delicious either way. Having said that, I do recommend using drier riced cauliflower whenever possible (see below for suggestions) because it results in sturdier flatbread. I want to spend a moment to talk about riced cauliflower. I highly recommend buying a bag of pre-riced cauliflower to save you time and effort. They’re available at Trader Joe’s and select supermarkets in the refrigerated produce section. Compared to ricing cauliflower manually, you won’t have to worry about processing it to the right consistency. If you are planning on ricing a head of cauliflower yourself, you can use a grater or a food processor. If you use the latter, you should process the florets until you get a rice consistency and no further. Do not over-mix, as the cauliflower will get wet and mushy, resulting in a wetter flatbread consistency after baking. 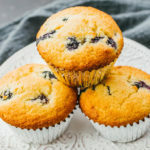 You also want to avoid blenders because it’s easier to over-mix when using them. That’s why the store-bought bags of riced cauliflower are so convenient — they’re nice and dry. The nutrition info below assumes generic store-bought basil pesto, but that doesn’t mean you can’t substitute with a different kind of pesto. I enjoy making homemade pesto using broccoli, and other fun variants include arugula walnut pesto or spinach pesto. If you use store-bought pesto, you might want to drain off any excess oil so that the resulting flatbead isn’t too oily. 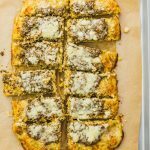 A healthy, low carb flatbread recipe using riced cauliflower, topped with pesto sauce and grated parmesan cheese. Place the riced cauliflower in a microwave-safe bowl and microwave uncovered on high until tender, about 2 minutes. When the cauliflower is done, let sit on the counter to cool, about 15 minutes, stirring occasionally to release steam. Prepare a large baking sheet lined with parchment paper or a baking mat. In a large mixing bowl, combine cauliflower, cheddar cheese, eggs, oregano, and salt. Stir until smooth. Transfer the mixture onto the lined baking sheet. Spread into a rectangular shape and flatten to about 3/4 inches thick. Bake at 425 F until the top is golden, about 25 minutes. After baking, top with pesto sauce, spreading it out evenly across the top. Sprinkle parmesan cheese on top. Return to the oven and bake until the pesto is hot and the cheese has melted, about a few minutes. Cut into long pieces and serve while hot. This recipe yields 4.5 g net carbs per serving (half of the entire flatbread). This was amazing! Definitely going into our weekly rotation. Ohhh yes- this is a low carb dieters dream!!! Looks so flavorful and delicious. Drooling over a cauliflower crust over here!